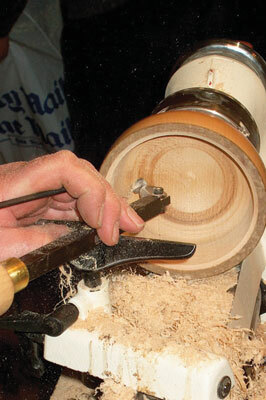 The club was formed in October 1997 when a group of like-minded woodturning enthusiasts got together for the first time. Since then, the club has expanded to a membership of 72 members, including a number of lady members. Members' skills range from the beginner hobbyist to the professional level turners. The club is administered by a committee elected at the February AGM. The club meets on the second Tuesday and fourth Saturday of the month, at Padworth Village Hall, which is just off the A4 between Newbury and Reading. The Tuesday meetings - 7.30pm - feature a demonstrator or a hands-on club night. Demonstrations are given by professional turners. 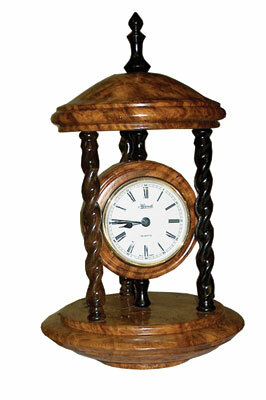 We have had many well-known and respected turners visit over the years, including lady turners. 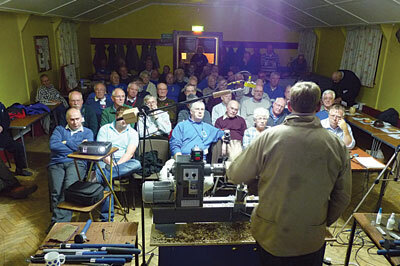 A theme is set for the hands-on evenings and with three club lathes and member's lathes, there are usually 4-5 groups competing with each other. Each group is led by a senior advanced member, and everyone is encouraged to participate. The club holds monthly competitions at Tuesday meetings for which themes are published in the annual programme. There are three classes; Novice, Intermediate and Advanced. Judging is carried out by members, and points awarded for first, second and third places. Members who accumulate the most points in their class over the year are awarded a shield at our December social function. There is also a cup for the member who attains the highest number of points annually in any of the three categories. This encourages members to show their skills, and is well supported with first class examples submitted. Over recent years the club was fortunate to receive grants from three local authorities. This enabled the club to invest in new lathes as well as audio visual equipment for use during demonstrations. This ensures members can clearly see what is going on. Recently we have been awarded a grant for dust extraction equipment. 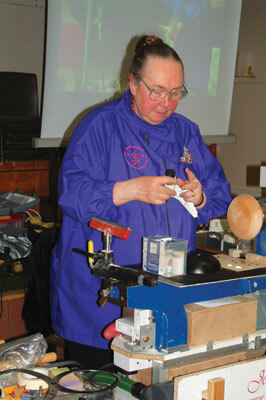 and CDs relating to woodturning. The club has recently established a tool bank containing more expensive turning tools which are available for hire by members. This allows members to try out a tool before investing themselves, or for those requiring one-off use. A local supplier attends the Tuesday meetings to sell a variety of wood blanks at very affordable prices. The club is involved in the local community in several ways. 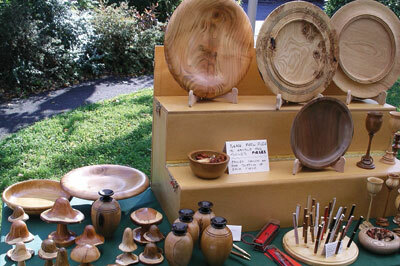 Each year in September, we attend the Aldermaston and Wasing Show and take a position in the craft marquee. Later in the year, in October, we attend the Thatcham Festival of Arts. This is an outside venue set up in the town square, but under cover. 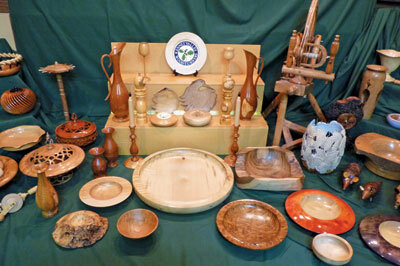 At both events membersâ€™ work is put on display and is available for sale. 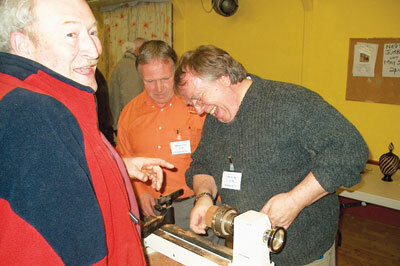 We take the club's small lathe - as well as a treadle lathe - and members demonstrate their skills throughout the show. This generates keen interest, and many enquiries are received regarding the club and its activities. 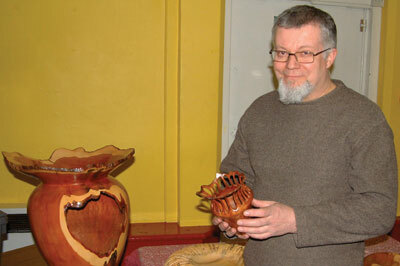 In the past the club has demonstrated at two care homes in the area and school fetes, to put something back into the community and to promote the club and the art of woodturning. and add more specialist tools to our tool bank. Our members are a varied and friendly bunch, and we are always pleased to welcome visitors and prospective new members.